Even after working with hospital gowns for years, I still get stumped trying to put one on a patient every now and then. They can be very tricky. Hopefully this page will help. Of course there are different sizes although at the hospital I work at, there are only two. It's better to have one too big rather than too small so when in doubt, use a larger one. Just make sure it's not dragging the ground or it will become a trip hazard and put the patient at a greater fall risk. Some of them are designed like an isolation gown while others have buttons that connect the sleeves. Although they are the ones that are the most confusing to assemble, I personally like them more because they are easier to take off and maneuver around things like IVs. Some of them also have a pocket in the front. This can be used to place a heart monitor in or even a jp drain. Just be careful and make sure the patient didn't leave anything in it before you throw it in the dirty linen bin. The easiest way to start putting a hospital gown on is to find the V-shape which goes at the front of the neck. There should be three or four buttons on either side for the sleeves. 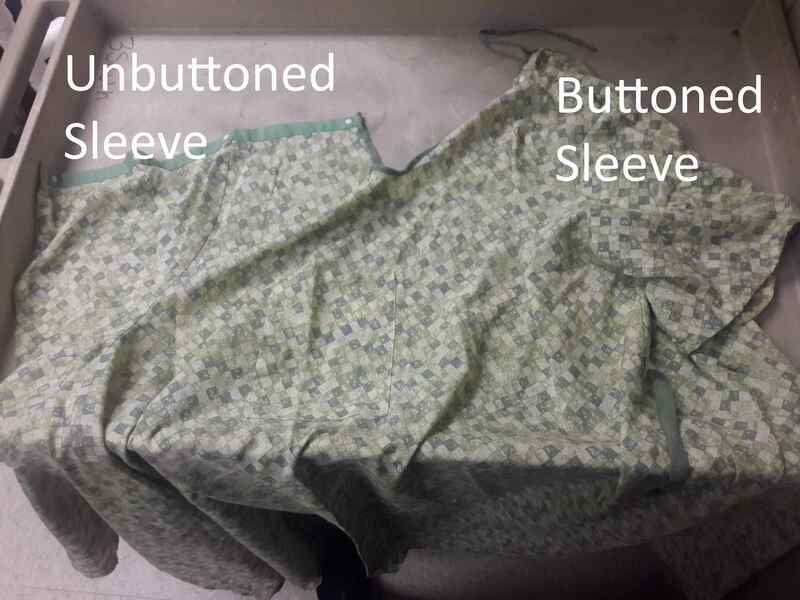 If the patient doesn't have anything connected to a particular arm, or better still, both arms, I'll usually go ahead and button the sleeve together and slide their arm through normally. However, if there is an IV or similar device in the patient's arm, put the highest end of the hospital gown over the shoulder and the lowest end underneath the patient's armpit. Then wrap the sleeve around the arm and shoulder until the buttons meet. Make sure the sleeve isn't twisted at all and then button it together. After the hospital gown is snug around the patient's shoulders, there should be two strings to tie it around the neck. One very useful trick I've learned is to tie it in front of the patient and then flip it around their head and down to their neck. It definitely beats trying to tie it behind them especially if they can't lift their upper body very well. I've lost count of how many patients who told me how much easier that simple little trick makes it. 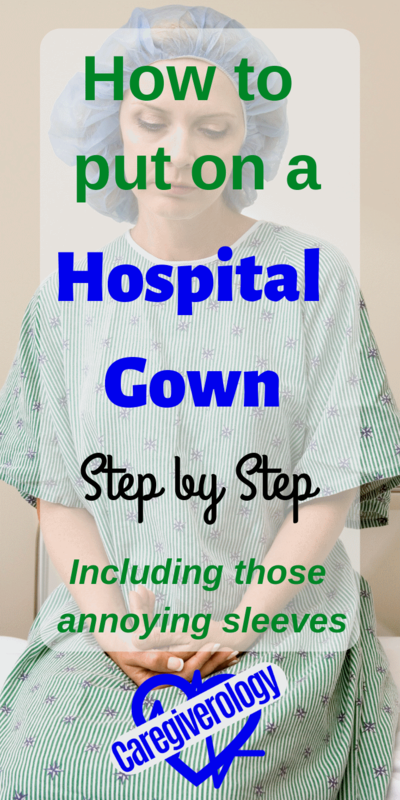 Most gowns can also be tied around the waist but if the patient is bedridden, it's probably safe to leave it untied. It gives them more room to breathe and there won't be a knot on their lower back. 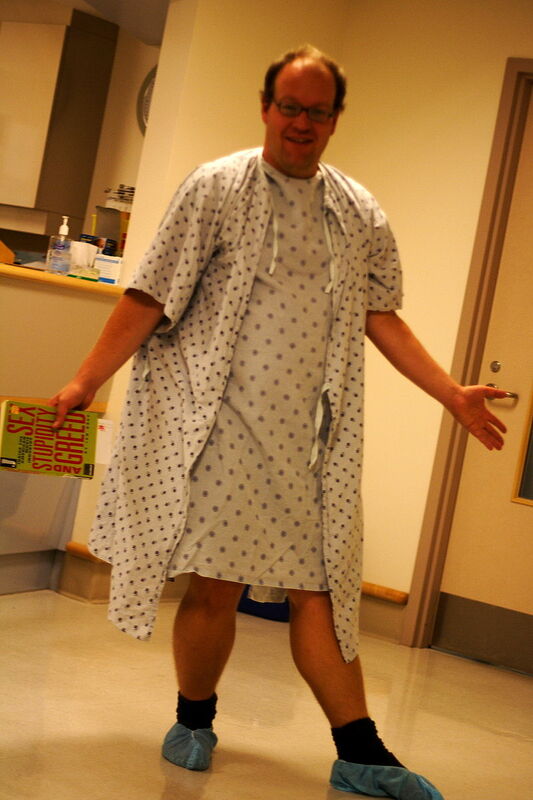 A lot of patients aren't too fond of wearing a hospital gown because they don't give much privacy. Make sure it is spread over them evenly covering as much of them as possible. I've known some to prefer to wear caregiver scrubs if the facility has extra although this isn't always an option. You should also try to reduce the amount of wrinkles and make sure part of it isn't jumbled up underneath them. It only takes a few twists and turns for them to get all twisted under the patient.